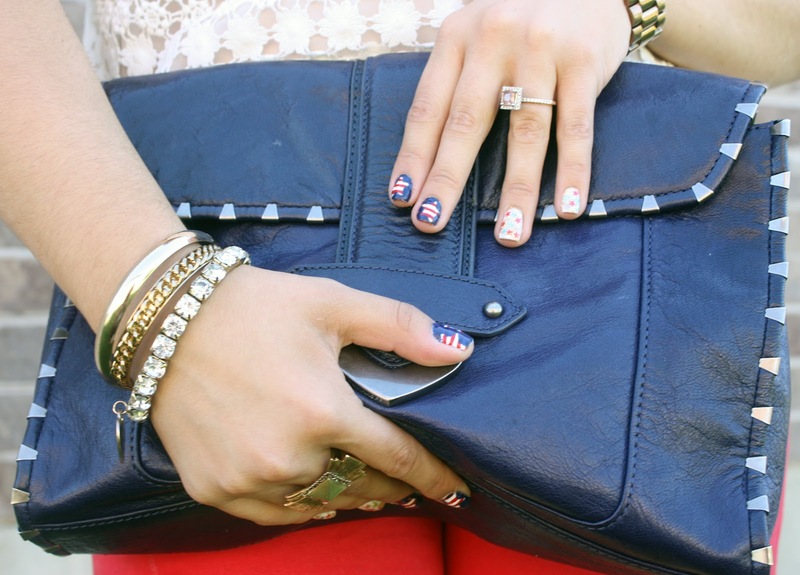 I tend to love holidays and pretty much any reason to get dressed up and celebrate, but the Fourth of July is my absolute favorite! 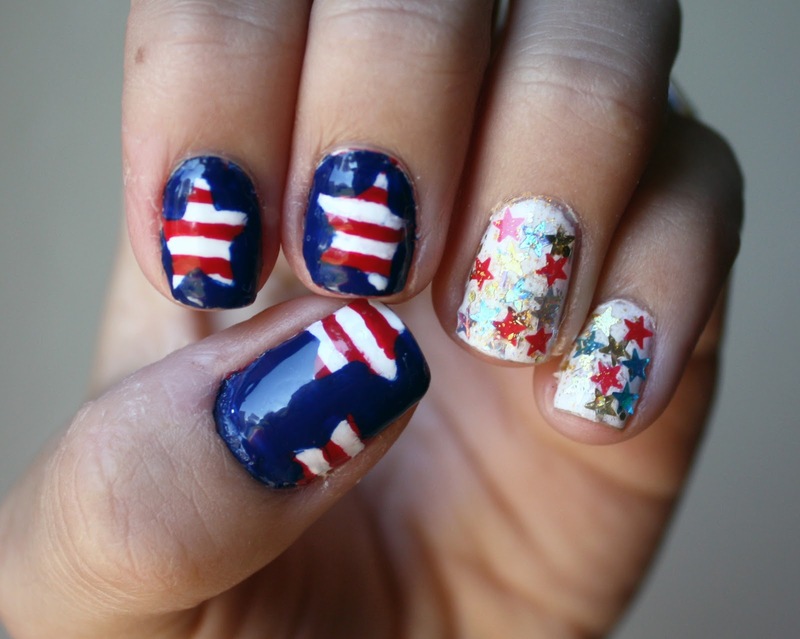 For that reason, I went all out with my patriotic-themed manicure this year. It's totally over-the-top star-tastic and I love it! For the first design, I painted a base coat of white (Pams & Kin's Karma Chameleon). I used my nail art striping brush to paint red stripes (Revlon nail enamel in Revlon Red). After it was super dry, I put some star-shaped stickers on parts of my nails then painted over them with a deep blue (Maybelline Color Show in Sapphire Siren). Before the polish dried, I quickly peeled off the star stickers to reveal red and white striped stars. For the second design, I started with a base of white (Pams & Kin's Karma Chameleon). Then I used my dotting tool to place star-shaped glitter on my nails (found in Fergie's Wet n Wild polish, Hollywood Walk of Fame). On top of that I did one coat of gold glitter (Pams & Kin's Grillz) and one coat of gold flakes (SEPHORA by OPI It's Real 18K Gold Top Coat). I sealed up every nail with my favorite top coat, Seche Vite Dry Fast. 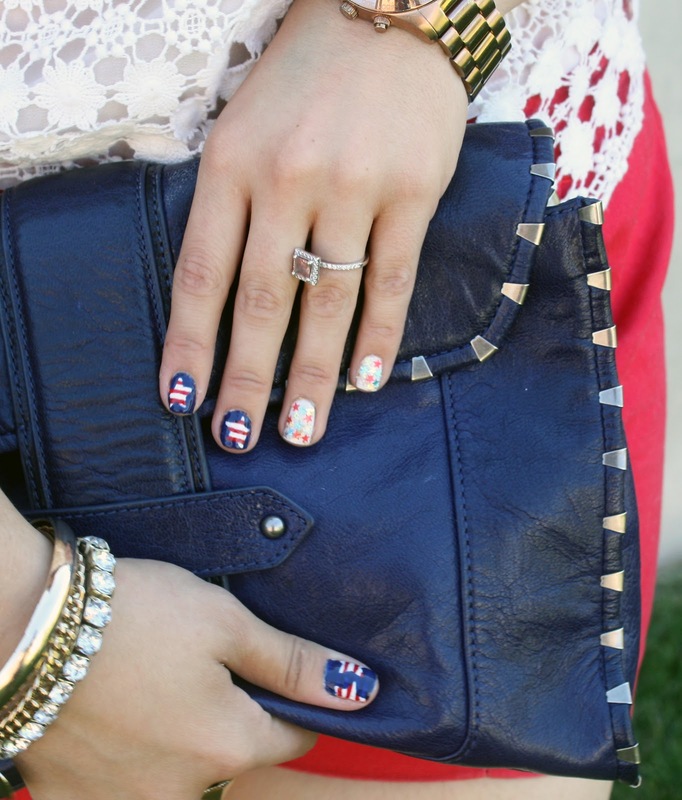 What are you wearing on your nails this Independence Day? 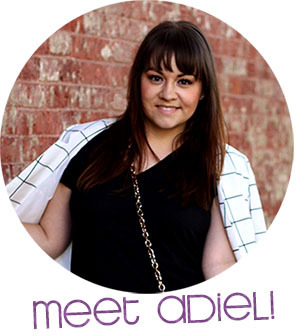 You are fab at the eye makeup! I wanna see a photo of it! Thanks! Hope you had a good one, Tomris! Awww, I hate when that happens to me! No fun! Thanks, Tori!